The amphitheatre could seat a whole legion - up to six thousand spectators. Nowadays it is sometimes used for open air events and re-enactments. Entry is free (except for special events) and there is free parking in Broadway (off High Street) and beside the rugby pitches and Barracks opposite. The site is now a national monument. 1. 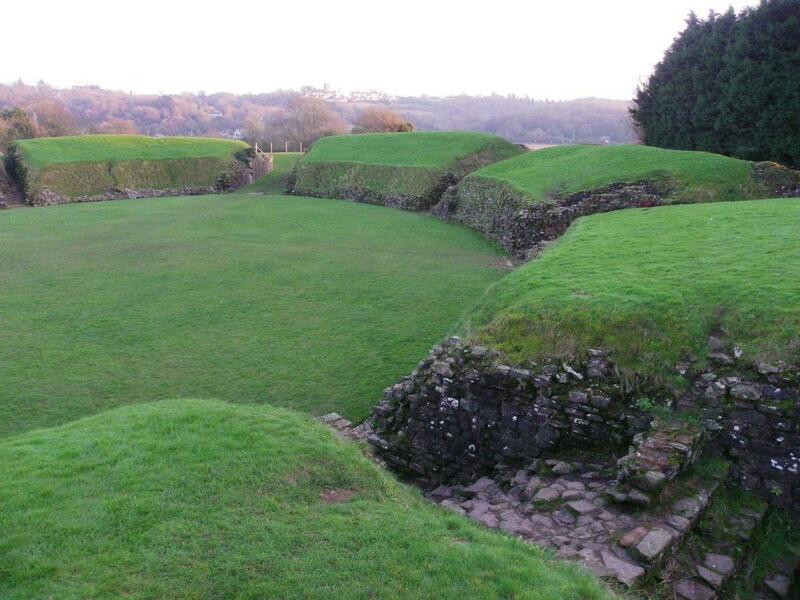 The Caerleon Roman Amphitheatre arena is oval - longer axis 56m, shorter axis 41.5m. The arena itself was originally lower than the outside ground level. 2. The arena wall rose to just under 4 yards above the arena and was covered with a smooth cement rendering. 3. The external wall was just under 2 yards thick with buttresses every 3 yards or so. 5. There was seating for 6000 spectators. The arena could therefore accommodate the entire legion plus visitors. 6. There were eight entrances. The two larger entrances served the arena and did not give access to the public seating.